I am waging a war here in the North Country. I am waging a war against spiders. I am the General and I am losing. Look, we bought the house in 2000, but the spiders think they are the real owners. That’s eighteen years of warfare. The two World Wars didn’t last that long. Okay, you can talk about the Hundred Year War in Europe, but I’m not a historian and I’m sure it wasn’t about spiders. I could stop the small weapon action with the whisk broom and rent a power washer. I could blast every shutter and every cornice and every eave. But I would lose. Seven minutes after I drive off to return the power washer, there would be a new spider web being spun, like a never-ending fairy tale. Sometimes I feel like we are living in something like the Addams Family house…or Castle Dracula in Transylvania. Spiders. Living in the woods. Where is Stephen King when we need him? I guess it just isn’t that simple. I spotted a cluster of Indian Pipes (Monotrope uniflora) on the path down to our dock. I always thought they were Saprophytes…living wholly off the decayed detritus of the forest floor. But no. I glimpsed something in the New York Times the other day that alluded to the fact that scientists are finding that the way the Pipes get nutrients is more complicated. So, on a recent night, Mariam and I went to a concert. The second part of the concert featured a world acclaimed pianist. Before she came on stage I looked up at the piano she was going to play. It was one large piano, a concert Steinway Grand…about the size of a ’49 Cadillac. If it wasn’t for its odd shape (like a piano) it reminded me of the coffin that Andre The Giant was buried in. [Full disclosure: My son, Brian, lives not very far from the Steinway & Sons factory (when they built them in Queens). He has no connection with the Steinway company so I’m not sure why I’m disclosing this]. We were in the second row. Great seats except you couldn’t see the pianists hands working the keyboard (music terms)…but then again you couldn’t see anything on that stage because of the size of that piano. She played the piece with total abandon and gusto. It was breath taking…except I couldn’t take my eyes off the collar of the guy in the front row. It was not straight. He was there with his wife (she sat in front of me) and two children. My first thought was what kind of wife was she? She let her husband go out into public with a messed up collar. Then she leaned forward. A tag on her blouse (shirt, top…whatever) was sticking up. I thought what kind of husband was he, letting his wife go out in public with a tag showing in her mid back. I considered making a deal with Mariam (she admitted being distracted by his collar after I brought it to her attention), that she could lean forward and straighten out his collar while I tucked the tag inside her top. We were conflicted. Mariam rejected the idea. I took another sip of Chardonnay from the ‘sippy-cup’ and settled back to listen to the last movement of a piano concerto. But I couldn’t take my eyes off the couple in front of us. He was clearly in love with his wife. He kept looking at her and even stroked her arm. She paid little attention to his attention…she chewed gun during the concert. Was this a dysfunctional family? Did she really love him? Then I looked at the two children they made together. The daughter was a pretty 18-year-old with freshly washed auburn hair. The boy was a well-behaved ten-year-old who sat patiently through a concert that he probably didn’t really want to attend. But this couple, with his collar and her tag, were responsible for their very existence. I guess some things are just not that simple. Mais ou sont les neiges d’antan! I can tell you where the snows of yesteryear are. I can also tell you where the snows of today are…and I can tell you where the snows of tomorrow, next week or two months from now are going to be. They’re on my front deck, my back deck and three feet deep in our tiny yard. I wonder why the oceans of the world still contain water. Most of the moisture of our blue planet seems to be covering the 1.3 acres that surround our home. In the last week, I’ve shoveled enough of the solid form of water to fill the Erie Canal. Which brings me to the topic of this post. Cabin fever. In legend and lore, in story and in song, the subject of cabin fever is quite common. It is a well-known condition that affects those in the North Country. From the gold miners of the Yukon to the fur trappers of Manitoba, grizzled men with beards and red suspenders have been known to lose their minds when confined to a lonely cabin…while the snow falls relentlessly. Some simply open the door and walk out into the frigid swirling blizzard and are never seen again. Some crawl under their Hudson Bay point blankets and fall asleep while their wood stove burns low and then turns to embers and then goes out. Someone will find the body in the Spring time. Others have been known to take their own lives, once the bottle of hooch is empty. And, others have turned to their fairest friends and best buddies and put a bullet into an unsuspecting brain pan. I, myself, was driven by near insanity to simply walk out the front door and into the Adirondack forest. But, the screen door wouldn’t open because of the snow accumulation. Besides, it wasn’t nearly cold enough…it was only -18 F.
I have been driven to violence. Two days ago I took a Macy’s carving knife (with a serrated blade) and hacked at a leftover breakfast burrito from the local health food store. My misery knew no limits. It puzzled me because, well, we don’t live in a cabin, we live in a house with a number of rooms and a fair library in my den. There’s always cable television (something the gold seekers of ’49 didn’t have). No, we have Spectrum with 200+ channels but nothing worth watching. We have the internet, but how many anti-Trump postings can one person click “like” on? And, one gets weary of playing Spider solitaire 377 times a day. So, what to do? Go out and shovel? No, we’re expecting 6-9″ this afternoon. Go to Whiteface and ski? The lift tickets are too pricey. Pay $90+ for a chance to get frostbite and/or a compound fracture of my left leg? Don’t think so. I think I’ll find a comfortable position on the sofa by the picture window and begin to count the snowflakes as they fall, minute by minute and day by day for the next three months. Is it possible that a eulogy can take forty-one years to deliver? The dreaded answer is yes. I know because I spoke that eulogy…silently, silently so that only I heard the words. It was a rambling prayer over a heart-breaking death. I knew the young man who had died. In truth, I was with him when he passed away, away into the unknown world that we all dread…whether we admit it or not. He is interred in the soil of his hometown in sunny and warm Louisiana. His soul departed on a snowy trail, on a cold night in the mountains of the Adirondacks. I’ve talked to him, about him and prayed for him for four decades. Our conversations weren’t all one-sided. I felt his presence. I felt his answers. I’ve felt his forgiving words when I find those occasional moments, when the moon is rising and the air is crisp and the snow is five inches deep…just like it was that night in November of 1974. Once before, many years ago, I stood over his grave. I remember that day. It was unbearably hot in the southern sun. I thought then of how I was so near him in such an opposition of environments…from when we last walked side by side. Now, I’ve returned with time heavy in my arms and dried wildflowers of the North Country in my hands. Now, the temperature is at a mid-point…from that night to this day. It’s 55 degrees. There are pine cones on the ground…not a flake of snow within five hundred miles. Yes, I’ve talked to him and relived our friendship when I stop to recall memories, those sweet and terrible memories. I’ve spoken to a few people about him, but I have never, until now, written a word about my friend. I’ve waited too long and kept too many recollections lock away in my heart and brain. I need to share these with you. We met in a hallway at the college I attended in Louisiana, or perhaps we met at the Pizza Inn where we worked evenings to earn a few extra dollars. I have never encountered a more curious individual. He picked my brain for hours about what life in the North was like. At the Pizza Inn, we were often left with the task of closing for the night. But, we wouldn’t simply clean-up and lock-up. No, after the lights were turned off, and before the ovens were shut down for the night, we would make a pizza, the likes of which was never seen on the menu. We’d lock the front door and find a booth in the back dining area. And there, by the light of a single candle (we didn’t want to attract the police who would be checking the locks on the doors of the businesses along the avenue), we would drink beer, eat pizza and talk for hours. We’d argue. We’d laugh. We discussed the philosophy of life. We talked about women. We talked about racism. (He was the farthest thing from a ‘redneck’ I ever encountered in my years in the 1960’s South.) More than once, when we left for our cars, the eastern skies were getting light. Time flew for us when we had important matters to ruminate about. A few years later, after I graduated and moved back to New York State, we kept up our friendship through letters. We had a chess game in progress for months, sending moves to each other on post cards. I don’t remember whose turn it was when our game ended so abruptly. He was curious about life outside of the South so he moved to Binghamton, where I was living. He got a job. I moved to Pennsylvania to begin a career of teaching. He wanted to join me on a hiking trip to the Adirondacks over the Thanksgiving break of 1974. I said yes. I wish I hadn’t. I will place this humble bouquet against the headstone. My wife will stand at my side. I will say a prayer for him to a God who I feel has been too quiet for too long. My private prayer for the dead will start with his name. Good night , dear heart, good night, good night. It was one of those rare days in mid-summer here in the north country. The sky was free of the clouds that seemed to linger…day after day after day. I was walking across our front deck and something caught my eye. It was a dragonfly trapped in a spider’s web. I chose to liberate the fly. It flew away, I could imagine, feeling safe and free in its tiny fly brain. I saw a thousand dragonflies this past summer. I tried to get close to study their amazing wings…but they flew away. A few days ago, after we had several frosts and even a dusting or two of snow, I was standing at the railing of our back deck. I had just finished blowing off the pine needles and leaves that constantly littered the deck floor. I emptied our tomato planter (we got about 12 tasty ones, small but full of flavor that only comes from something you’ve grown yourself). Yes, I was standing at the railing and looking up at the overcast sky. Summer had come and gone. A few leaves held onto their parent-trees…refusing to give up, drop and then to rot away into our sandy soil. A slight chill came in with the breeze that came in off the lake. The insects of the late summer had been dead for weeks due to the frost. Or so I thought. I looked down on the 2 x 4 pine railing (stained a light-oak) and saw a survivor. Not just any survivor, but a dragonfly. It was motionless on the wood surface. I blew on it. It didn’t move. I was sure it was dead…but why did it die on my railing? And, why didn’t it get blown away by the autumn winds? A small part of me was glad it had chosen to die (do they choose?) on my deck. Now, I could take it downstairs to my “man-cave”, pull out my binocular microscope and take time to really study the intricate and mathematically precise structure of the lattice-work of the wings. I could look closely at what I assumed was a compound eye. I could sketch it. Admire it. Study it. And marvel at it. Just then, in the chill air of the deck, it moved! It was alive! How could this be? By all rights of nature, it should have been food by now…or lying among the rotting leaves and ferns and moss of our yard ten feet below me. I don’t know enough about a dragonflies’ life-cycle to think that it missed the Great Migration. I don’t even know if they do migrate. I doubt it. But there it was…on my deck. I coaxed it onto my hand. It didn’t try to fly away…just yet. I held it close to my eye. 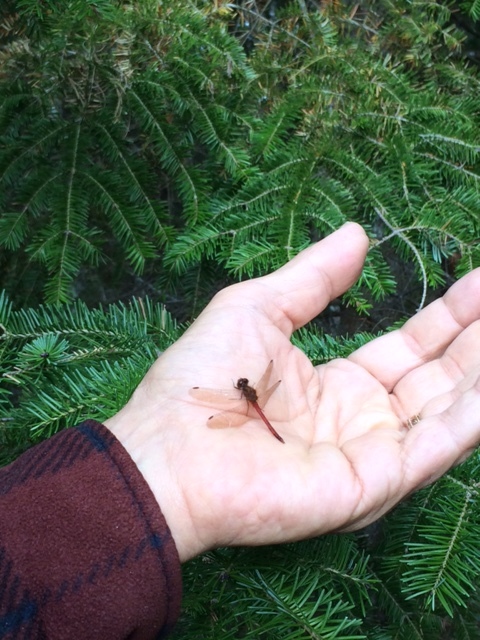 It was then that I knew that whatever happened, I was holding a dragonfly that had only hours to live. Something would get it. It couldn’t survive much longer. I stared into its eyes. I had a thought. Was this the fly I freed a month or two ago? Was this the offspring of the fly I liberated? How could I ever know? But, I can say this, I had two encounters with dragonflies this summer. Hundreds that sat on my knee while I read, or sat on the lip of my glass of sun-tea. They filled the air of my deck space. And their iridescence was magnificent. I came eye to eye with only two. There must be a connection. There has to be a connection. I want there to be a connection. Did the fly stay around in hopes that I would find it? Did it want to thank me for saving its life? Or it’s parents’ life? I’d like to think so. I’ll never know. After a moment in my palm, it flew away…slowly at first…and then it vanished into the needle-covered pine trees at the edge of our property.